Mazarin 72 Fly bridge for sale. This fly bridge yacht built by a German shipyard, offers all the facilities of a modern yacht. A huge garage, crew cabin and a large hydraulic bathing platform are just some of the features this boat offers and makes it belong to the big boat family. Spacious cockpit that can accommodate up to 10 guests, and the same capacity on the fly bridge. The galley is located on the main deck and enables the crew to serve guests easily by the short distance to the aft deck and fly bridge. Very sporty lines and great performance make this yacht a winner in the 70' plus range. In excellent condition this yacht is worth viewing and offers you a lot of Yacht for the money, huge spaces, solidly built, ready for the season, berth and crew available if required, a well built and finished Yacht. Accommodation comprises of 4 guest cabins, The VIP in the bow with en-suite, a full beam Master cabin with walk in wardrobe, with en suite, a further 2 cabins, 1 x twin bunks and 1 x double bed cabin which share the bathroom, which doubles as the day head. Ideal charter Yacht open to serious offers. The berth is in the best position in Palma de Mallorca and is a huge plus with the scarcity of moorings in this area. 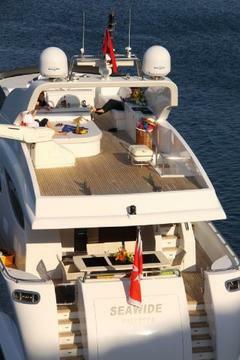 With accommodation in 4 cabins for 8 guests overnight and for 10 guests on the fly bridge and cockpit, this Yacht offers exceptional entertaining facilities. There is a separate crew cabin for 2.